The cost of parking in Edinburgh city centre within zones 1-4 currently varies not just from zone to zone but also from street to street. As well as the estimated cost of paying for a space on Sunday being considerable, nearly £30 in some cases, the number of on-street spaces for non-permit holders is limited. To add further pain to the equation, a four-hour maximum stay policy operates between Monday to Saturday. If that policy is maintained on Sundays it will mean having to move at least once in a visit. Under present arrangements, the price to park on the Capital’s “flagship” streets – George Street, St Andrew Square, Queen Street, Market Street and Cockburn Street – is £4.60 an hour. Running on the basis that charges will start at 12.30pm on Sundays only (they usually kick in from 8.30am) and finish at 6.30pm as they do on the other six days, that could mean visitors parking on those streets paying an eye-watering £27.60 for a six-hour stay. Finding a space on streets on the next pricing level down – Stafford Street, Melville Street, Morrison Street to Shandwick Place and the Old Town (including East Market Street) – doesn’t come in much cheaper either. Working on the same calculations, with an hourly rate of £4.10 an hour it would cost anyone parking there £24.60 for six hours on a Sunday. 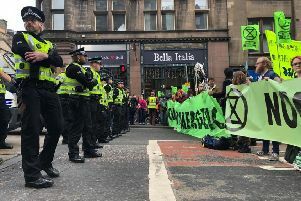 Throughout the majority of the remainder of the streets covered by zones 1-4 including West End, Moray Place, the South Side / Nicolson Street and Tollcross/ Fountainbridge and Heriot Row, anyone parking up for the full six hours will be charged £18.60.